After self-examination, the second direction of growth while being a follower is "out right," fellowship. You must learn how to reach out to your family. Fellowship requires attendance, involvement, and belonging. A woman was telling her friend about the small congregation she attended. "Why, sometimes our attendance is so bad," she said, "that when the preacher says, 'Dearly beloved,' I start to blush." No organization can survive for very long if its members fail to spend time with each other. Fellowship requires your presence. Perhaps the most commonly used passage of Scripture on attendance is Hebrews 10:24-25. "And let us consider one another in order to stir up love and good works, not forsaking the assembling of ourselves together, as is the manner of some, but exhorting one another, and so much the more as you see the Day approaching." (NKJV) Consider several principles that this Scripture teaches us. "...consider one another in order to stir up...." The Greek word that is here translated "consider" means to direct one's entire mind on someone or something. Fellowship requires selfless focus and genuine respect for the needs of others. 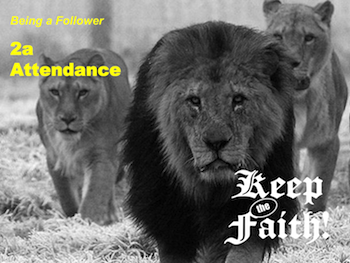 Your attendance is important because your family needs to be with you. Your presence can stir them up. Your absence can discourage them from being faithful. As a member of the family, you must "consider" the needs of others. "...forsaking the assembling of ourselves together, as is the manner of some...." The Greek word that is here translated "forsaking" means to abandon or leave helpless. This passage is not addressing those who occasionally miss assemblies because of health or other unavoidable problems. This Scripture targets those whose "manner" or habit it is to be absent. When services are missed out of choice or convenience, God is offended because you have placed assembling with His people second on your list of priorities. This is called idolatry. "...and so much the more as you see the Day approaching." To what "Day" is the writer referring? One of the most important rules of Bible study is to keep all verses within their context. Read on. Just a few verses later (verses 35-39), the passage talks about God receiving us at Christ's coming. Life is hard and our family needs us in order to survive until Christ comes. We must encourage one another through our attendance, and so much the more as we see the Day approaching. This is called fellowship. Above, we have emphasized the needs of others. But before concluding, it must be pointed out that attendance is also important because of your needs. Consider three other phrases from this same passage. "...in order to stir up love...." The Greek concept that is translated "to stir up" is often used negatively. Some have even translated it, "to incite love." Here, however, the stirring up is genuinely positive. You need this stirring because, like everyone else in this wicked world, you are often tempted to hate rather than to love. Do not allow Satan to pull you back into his dark world of negative thoughts and cold-hearted reactions. Embrace God's fellowship. "...in order to stir up... good works...." You also need stirring when it comes to doing good. Like all Christians, you often face discouragement and spiritual exhaustion. Satan longs for those moments. He wants you to quit. He hopes you will fail. It is fellowship with God's people that can keep you strong. Sometimes you will need to carry and sometimes you will need to be carried. Do not give up. Let God's fellowship stir you. "...exhorting one another...." Fellowship pushes, prods, and pulls you toward Heaven. It will lift you when you are losing and it will cheer you when you are winning. Do not forsake the fellowship of God's people. Like all new changes in schedule, it may take time for you to get used to regular church attendance. The more you do it, the easier it will become. Make a list of the reasons you want to attend. Remind yourself of them often. Make a list of the people who will be discouraged if you fail to attend. Avoid events that will conflict with or tempt you to miss God's fellowship. Find a job for yourself. It is much more difficult to miss if you know you will be missed. What can Christians do to become better at considering one another? In what way does fellowship "stir up" love? Make a list of three "good works" that fellowship has stirred in you. Make a list of three areas in your life that, if you let them, could cause you to get into the habit of missing God's assemblies. Define the word "exhorting" and give examples. As Christians, we should long for the "Day" of Christ's return. How does a person develop this longing? What part does attendance play in its development? Next time we will look at the second area of fellowship - involvement. Until then, keep the faith! Also, don't forget the first three lessons in the "Being a Follower" section! Back to Top of "Keep the Faith! Being a Follower 2a"